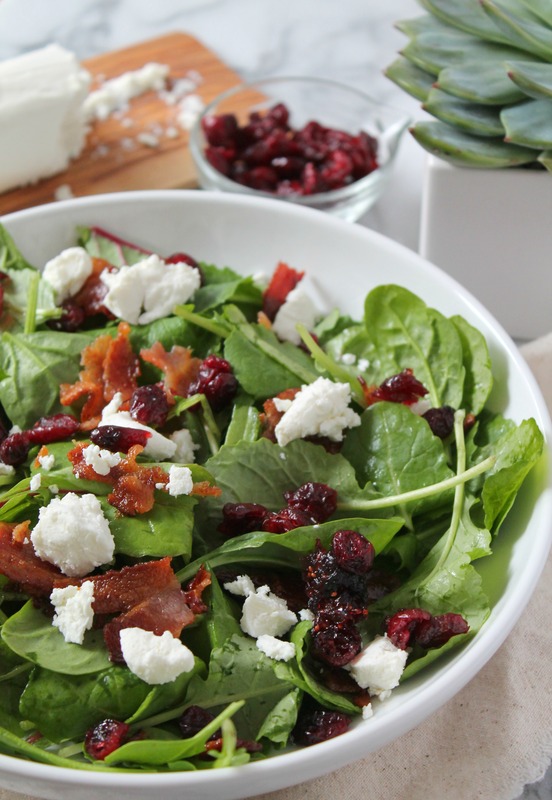 Fall Greens Salad with Bacon is just what you need this season – a salad that’s easy to put together, has great flavor, and pairs well either with a holiday table or just your every day dinner. This post is sponsored by Bounty. Sometimes, all you need is a simple salad. Holiday season gets overwhelming with us trying to do so much: buy all the gifts, clean the house, create and execute a menu, travel to see friends and family, among all other things. It’s crazy that we stress ourselves out so much when the season is really about spending time with family, relaxing, and creating memories. That’s why I say that sometimes all you need is a simple salad, but the simplest of things are the best of things. This Fall Greens Salad with Bacon is just that – four ingredients that when tossed with a delicious dressing of your choice (I suggest this Green Goddess Dressing or Tahini Turmeric Dressing), is a lovely addition to your holiday table or perfect for weeknight meals along with a protein like chicken or beef. Use layered paper towels on a plate to place just cooked bacon on. This not only absorbs the extra grease, but the less grease, the crispier the bacon will be! When washing herbs and greens, use Bounty paper towels to soak up the excess moisture – this is a hygienic way to dry ingredients. Not only are Bounty paper towels great for meal prep, but when it comes to clean up, they perform fantastically! Tuck on the side of your holiday table for quick messes you’ll need to pick up instead of running around looking for a mop when the little ones drop a slice of pumpkin pie on the floor. Make sure to stop by the Bounty website for coupons and deals – and happy holidays! Fall Greens Salad is easily customizable but this bas recipe is my favorite for the fall and winter seasons. Preheat the oven to 350F and line a baking sheet with parchment or aluminum paper. Place strips of bacon on tray an bake until crispy, about 12 minutes. Remove bacon from tray and have another tray layered with Bounty Paper Towels to absorb the bacon grease - place bacon here. 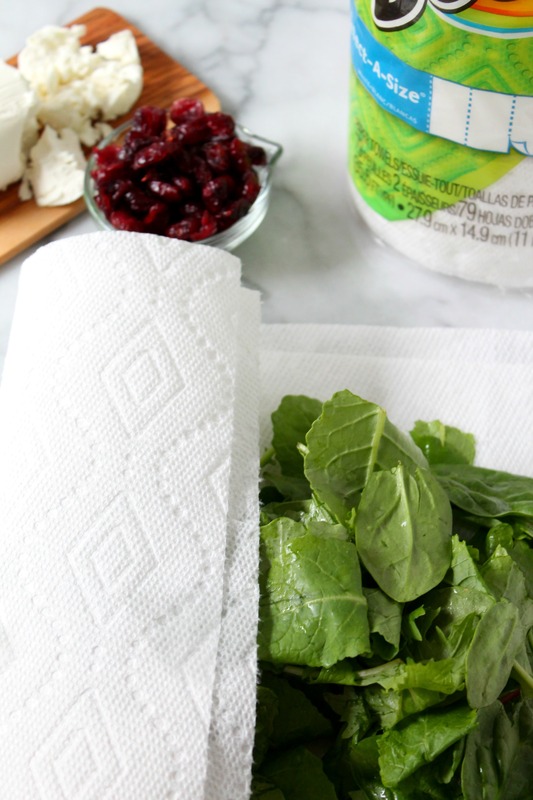 Wash the greens and wrap in Bounty Paper Towels to remove excess moisture. 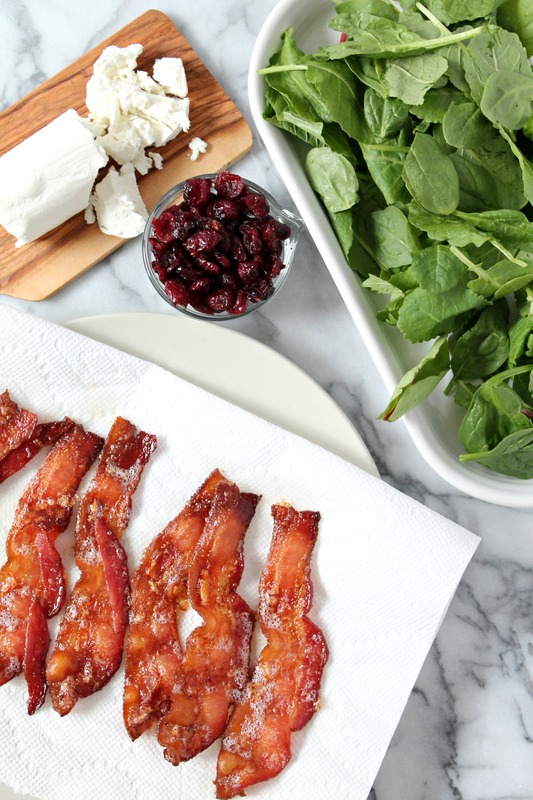 To make salad, toss everything together and crumbled bacon on top. Use whatever dressing you love to season.